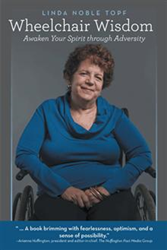 As a follow-up to her first book, “Seven Principles for Meeting the Challenge,” author Linda Noble Topf supplements her advice on living with a disease – but not losing personal identity in the face of that disease – in her new book, “Wheelchair Wisdom: Awaken Your Spirit through Adversity” (published by iUniverse). Topf, who has lived with multiple sclerosis since 1981, shatters widespread notions of what it’s like to spend life in a wheelchair by offering a practical spiritual guide to living life as one’s true self and exploring what is possible, regardless of any challenges. “It is my intention that you will come away feeling lighter, more loving, more forgiving and freer from having had the courage to let something go that no longer supports the reinvented, authentic you,” Topf says. “Her clear, accessible prose style makes her an important voice in her field, and her life is an inspiration in itself. Linda Noble Topf has had multiple sclerosis since 1981 and is an advocate for disability rights. As an ordained minister, wellness coach, professional speaker, blogger for the Huffington Post and author, she assists others in seeing how chronic illness can be an opportunity for personal and spiritual growth. She resides near Philadelphia. More information is available at http://www.wheelchairwisdom.com.